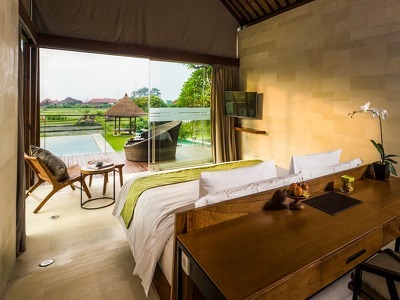 Whichever room you choose at The Samata you won't be disappointed with space, layout or style. They all include 24-hour butler service, minibars, complimentary water & WiFi and luxury body and bath products including handmade soaps.Most of the rooms have baths in the bathroom except one of the Ocean View Suites and The Samata Residence and all rooms have showers. The Spa Suite has a private treatment room overlooking the Energy pools and gardens. Ideal for 2 adults and 2 children these suites overlook the Indian Ocean and rice fields and feature a large outdoor deck. One bedroom villa featuring a private pool, bale bengong, outdoor living area, dining area and kitchen overlooking the Indian Ocean and rice fields. This villa is perfect for honeymooners or a small family. 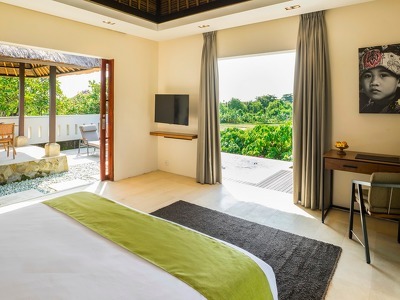 This Two Bedroom Pool Villa features a large private pool, bale bengong, semi outdoor living and dining area and fully-equipped kitchen overlooking the Indian Ocean and rice fields. This villa is perfect for two couples or a family of four. The Samata Residence is a three bedroom villa with a large private pool and extensive garden, large bale bengong (daybed), semi-outdoor living room and dining area, fully-equipped kitchen overlooking the Indian Ocean and rice fields. 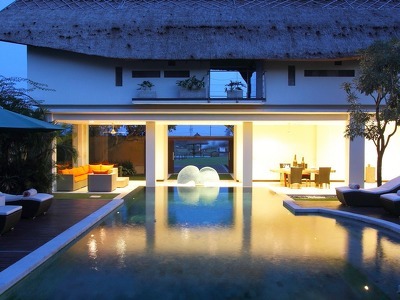 This villa is perfect for a group of friends or a large family. Situated in one of the most beautiful parts of Bali, surrounded by rice fields, The Samata is an idyllic retreat with just ten suites and pool villas. A state-of-the-art fitness room with personal trainers, a pampering spa, healthy eating and views of the sparkling Indian Ocean make it one of the best and most unique healthy hideaways on the island. In the ancient language Sanskrit, “Samata” means the state of balance between mind, body and spirit, and that's exactly what The Samata delivers. In line with the concept of Lifestyle Retreats (a collection of like-minded lifestyle properties with highly personalised service), The Samata provides an experience where you can improve your lifestyle balance by focusing on wellbeing, relaxation and healthy eating. The Samata is unique in Bali – a small, exclusive, Chic Retreat dedicated to ensuring both body and mind are fit and healthy. Here at The Samata, there's a luxurious and fully-equipped gym and boxing ring, healthy eating, blissful pools, a tennis court and a spa with comprehensive Balinese traditional treatments and bespoke personal training. Well-known sports and fitness professionals are invited for periods throughout the year to share their knowledge and experience with you for group and one-to-one sessions. The Samata also has a spacious yoga and meditation room, which is available for private or group classes. The Masters are a team of experts in particular fields of health and wellness who offer specialised wisdom and teaching to you during your stay and are in residence at various Lifestyle Retreats at different times of the year. Activities are not limited to the hotel, the team can arrange a morning sunrise tour to the beach, water sports at Sanur, kite surfing and more. The spa is above the gym and has four treatment rooms with a variety of therapies to choose from all using natural products based on Bali's traditions. ZENSO specialises in healthy dining and dishes include a significant amount of superfoods including nuts, spices, grains and pulses. Each dish is carefully prepared according to the individual's BMI and the intensity of the exercise programme. Don't worry, there are dishes including butter and cream should you wish to have a more care-free stay! And there's a selection of wine and cocktails to choose from. ZENSO is open from 7 am to midnight and it's very relaxed with no dress code. The Samata is one of only a few hotels in Bali to focus on health and fitness for the body and mind. Whether you’re after mild exercise, dawn yoga, full-on cardio workouts, kick-boxing, weight training or playing a set or two of the tennis court, it delivers. Against the backdrop of rice fields and with the sound of the nearby ocean waves, it’s easy to see why people come here year after year. 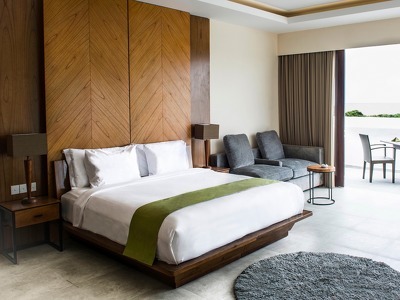 Located in north Sanur - Bali, The Samata can be reached by car or taxi with only 35 minutes drive from Ngurah Rai International Airport or 10 minutes drive from Sanur area. Chic Treats are not combinable. Whichever room you choose at The Samata you won't be disappointed with space, layout or style. They all include 24-hour butler service, minibars, complimentary water & WiFi and luxury body and bath products including handmade soaps. 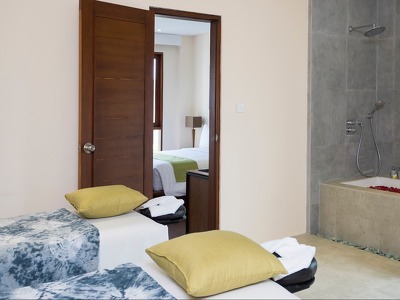 Most of the rooms have baths in the bathroom except one of the Ocean View Suites and The Samata Residence and all rooms have showers. Good Palace in Denpasar Timur - Bali.